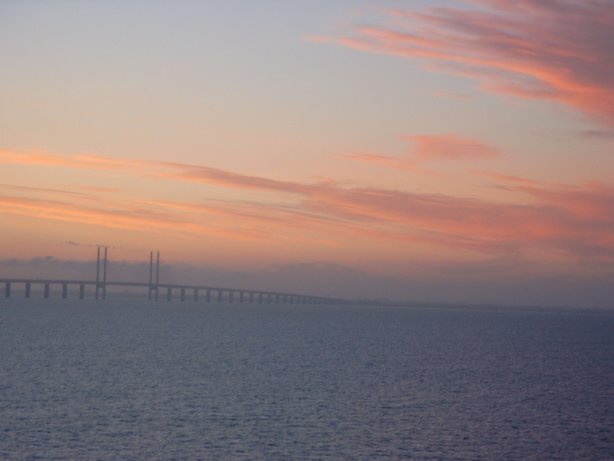 The suspension bridge connecting Denmark and Sweden. I took this on our last cruise. Yesterday at the Carl Bean House, the plan was that I would show up about 1:15 in the atrium room and start playing. Whoever might be around would be finishing lunch and would hear the music and come out. So I got there, but when I walked through the lunchroom, it was empty. I shrugged it off and went over to the big upright piano in the atrium. I moved it away from the wall so that I could get a better look at the room where the sofas were laid out in a circle, nurse's station at the far end. Then met Chaplain Tim (who is just so cute) who thanked me for being there and tried to apologize that there weren't any patients out in the atrium. However, I quickly told him that I already had seem most of them in the rooms adjoining us. Their doors were open to the big room and they could hear me. He took off to help someone in a crisis and I went back to the piano. Near me was a nurse and on the far side were three other nurses working. (I started playing and during the second number the maintenance man noticed that the moved piano, grabbed his mop and began cleaning up the dusty floor where it had stood before). At about half past, I started singing. The atrium is really tall and arched, so I kind of pointed my head in a strategic spot and my voice was naturally amplified acoustically. Sounded great! I was disappointed, however, that more people didn't drift in to listen. A couple of guys stopped in and stayed, but by the end of the performance at a quarter after, it was just the nurses and myself. I worried that I had let them down in some way. I packed up my things, moved the piano back in place and started to leave when one of the nurses stopped me. She whispered, "Hey! Look around..."
She gestured toward the open doors of all the rooms lining the atrium, the rooms holding the sickest of patients. She leaned in, "They're all asleep. You gave us so much peace today. Thank you." Chaplain Tim hurried out. "I was talking to a man who was truly suffering some terrible news. Your music helped me to be more present, and to allow someone to share devastating feelings, and begin to heal from the devastation. Your music was help, a treatment, and a gift." October 16 - 24, 2003. The two of us stood outside on a deck right in the middle of a crowded little block of apartments in the South Market area of San Francisco near Folsom. It faces a big brick wall, but if you look up, you can see the sky. Today the sky was brilliantly blue. Totally clear except for occasional white puffs of energy that zipped across the sky faster than you ever imagined clouds would move on a beautiful warm/hot day. The blue skies over a Christian Orthodox Church in SF. I didn't really know what to say to him. I mostly just listened. For the sake of his privacy I don't want to reveal too much, but let's just say he is picturing the end of his life. It's in reach. He doesn't look like it. He's healthy as a horse, has a brilliant mind, handsome face, but lives with a great deal of pain. He was proud of himself today because he had biked all the way to the Golden Gate Bridge. With his disease, the treatment is so severe and "the cure" so fractionally achievable, he chose quality of life over quantity of life, i.e. no treatment. "I am going to do everything I ever wanted to do -- and I'm going to do it now." I told him I was thinking about a high school friend of mine who was just diagnosed with cancer. I heard about it from his wife (who I have never met) who wrote me and asked me to call and see how he's doing. He actually sounded okay. Shaken. Scared. Broke from medical bills. But still coping. When I spoke with her again, though, I asked her, "And how are you doing?" It was if she fell into my arms with relief to be able to talk about it. I said, "Everyone's disappearing, aren't they? They're afraid to come around." She shouted, "Oh YES! How did you know?" A lot of people are just afraid to be around any kind of disease, sometimes because they want so badly to make things better and they can't. So they get frustrated. Others are afraid to look disease/death in the eye. They imagine themselves going through it and it scares them. I did a lot of listening in San Francisco. Also visited with my friend Ken McPherson. He and I are collaborating on a theatrical project based on his own life experience, so a lot of the time I was listening to him tell stories of the early AIDS activist movement. He was involved with Mobilization Against AIDS, the precurser of most modern AIDS groups. They created the first candlelight vigil, a concept the spread like wildfire around the world during the earliest, darkest days of the disease in the USA. "Hibernia Beach," a historical corner in the Castro. This is where the first public AIDS education and activism started in SF. Queer Jitterbugs advertise at Hibernia Beach their weekly dance. gay veteran Leonard Matlovich lived. First openly gay veteran buried in Congressional Cemetary. I also met another early activist named Paul. Paul told me how they'd meet every week to plan some kind of action. He would see people show up, start to die, get slowly sicker from meeting to meeting until they just disappeared. "We couldn't stop back then. Everyone was dying! You just held on and fought." Steve with Piper the Dog.